The want of a decent guidebook can be all that stands between the novice forager and a great meal or a trip to the hospital – or worse. 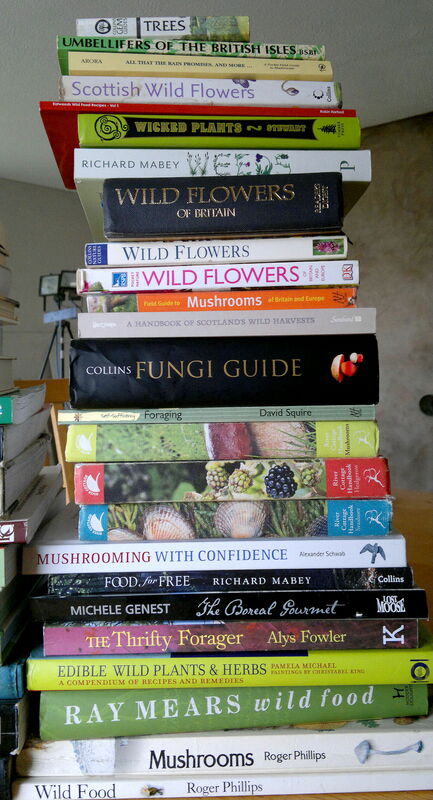 I’m afraid there is no single book that can answer all your foraging questions and make you a confident wild-fooder overnight. The key is to enjoy the process of identification and return to species that elude you the first time. SPECIALIST FORAGING GUIDES AND OTHER RECOMMENDATIONS – including seaweed, herbalism, non-food plant guides – coming soon. Here is some general advice to consider if you are choosing a guide book followed by a run through some of my recommendations. 1. You can never have too many identification books. The more you have, the greater certainty you can arrive at over an identification – eventually. This isn’t as straightforward as it seems: what may seem like a perfect match in one book may be uncertain in another. Plants and fungi can look very different at different stages of growth and no one book can show them at every stage. Having said that, some guide books can be too comprehensive, bombarding beginners with every hybrid and rarity known to science – no matter how rare. 2. Field guides v Reference books. While it is vital to carry a portable field guide for on-the-spot identification, few are comprehensive. A larger tome at home to help pin down a testing identification and provide background and inspiration is a great help. 3. Identification v Inspiration. I am yet to find a book that manages to combine a clear identification guide with the kind of foraging, harvesting, cooking, background and environmental information that can equip and inspire a beginner. ID guides tend to be just that. 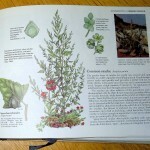 General foraging guides often provide a wealth of inspirational information but lack clear detailed pictures. 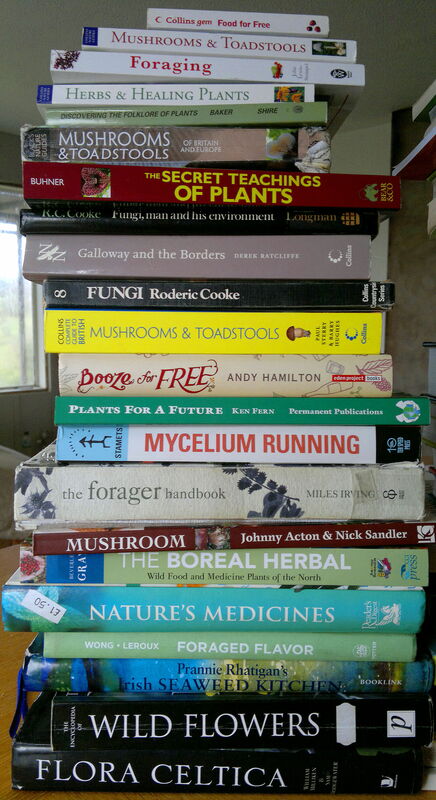 The mycologists and plant scientists that tend to write technical ID books are seldom committed food foragers and foraging experts generally lack the qualifications after their name that would reassure a publisher of their expertise. Space is often an issue too: There are a few books that attempt to cover the full forager’s repertoire – woodland/hedgerow plants, fungi, coastal plants/seaweed and shellfish – but that is a lot of ground to cover and they tend to lack in-depth information. 4. Illustrations v Photographs. A well illustrated book can emphasise important botanical characteristics that may not be obvious from photographs. On the other hand illustrators tend to portray idealised versions of species that you will never find in nature. Its really a matter of personal preference. Some of the best guide books have both photos and illustrations. 5. Websites and social media. We are fortunate nowadays to have masses of information at our fingertips. It is important to look at the providence and quality of this information with a critical eye and never place too much trust in any one source. Nobody checks the credentials of bloggers (myself included!). There are many passionate and knowledgeable people online who will gladly help to identify what you have found – but please read this before sending your queries. A list of my favourite foraging websites appears below the book reviews. 6. Identification apps. Plant and fungi ID apps are now widely available and seem to be well liked by people who use them. I welcome the way they can bring the pleasures of foraging to a wider audience but think there is a danger that users place too much faith in them and neglect the development of their own skills. I would draw a comparison with GPS navigational gadgets, which I have more experience of. While they are incredibly useful, there is a tendency to become over reliant at the expense of proper map and observational navigation skills. This is both dangerous (electronic gadgetry can break down leaving you lost) and a bit sad: a journey should be about so much more than getting from A to B as quickly and efficiently as possible. If you are hoping to go out into the wild and gather ingredients from nature as you would pluck produce from a supermarket shelf, I would suggest that you have the wrong idea about foraging. Here are my recommended book sets. You can find details of all of them and more on the pages of reviews listed below. Below are links to brief reviews of some of the books in my collection with guidance on relative strengths and weaknesses. I’m afraid my collection isn’t exhaustive while my time is, so apologies for what is left out – I would be happy to add to the list if review copies are provided and please feel free to add your recommendations to the comments list below. Coming soon: SPECIALIST FORAGING GUIDES AND OTHER RECOMMENDATIONS – including seaweed, herbalism, non-food plant guides. I enjoyed listening to you on radio 4 and am now inspired to try foraging ! I will look at weeds differently now and beach plants! Hi, thanks so much for this website, very interesting and inspiring! Just wondering what book the picture is of on this page under the writing of the 4th section ‘Illustrations v Photographs’. Many thanks! Thanks – glad you are enjoying the website. That book is the Reader’s Digest Guide to the Wild Flowers of UK. Its absolutely superb, though not specifically aimed at foragers. The mini book Wild Food is the best starter book. But since starting collecting.. Well, I have a heaving bookcase! Great post, thanks.